The Cards had taken a 2-0 lead in the second inning thanks to Yadier Molina’s RBI single that drove in Matt Carpenter, who’d walked, and Allen Craig, who’d doubled. The RBIs were Yadi’s first in June and first since May 24. The lead increased to 3-0 the next inning when Carpenter singled in Jon Jay. And then the fourth inning happened, and the lead disappeared. 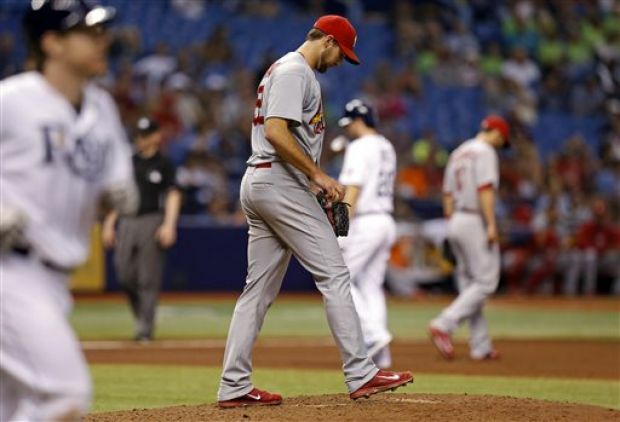 In the fifth, the Cardinals did have a chance to score — they’d loaded the bases after Yadi singled, Jay was hit by a pitch and Mark Ellis walked to bring Peter Bourjos to the plate. He lined it to right-center, and it was gorgeous … gorgeously caught by Rays right fielder Kevin Kiermaier that is, in an absolutely tremendous leaping catch. It had thus become that kind of night. Again. The only Cards baserunners after the fifth inning came via walk or hit-by-pitch. For several weeks, manager Mike Matheny has been talking about the team needing to “find its identity” and describing how even a third of the way into the season the Cardinals didn’t have one. Or, rather, didn’t have one they wanted. They were that team at times on this trip. Sustaining it is the next goal. Yeah, being that team they have shown themselves capable of at times seems to be the real trick thus far in 2014. And maybe it’s just me, but it doesn’t seem like it should have to be such a fight and a grind — though, obviously, it has been through the first 66 games. After today’s day off, the Nationals head to town. At the moment, they’re on a four-game winning streak and have taken three straight from the Giants with game four this afternoon at 2:45 p.m. Central Time. Starting tomorrow are Jordan Zimmermann and Lance Lynn, with game time 7:15 p.m. This entry was posted in 2014 Cardinals and tagged Allen Craig, Interleague play, Jon Jay, Matt Carpenter, Michael Wacha, Mike Matheny, Peter Bourjos, Tampa Bay Rays, Yadier Molina by Christine Coleman. Bookmark the permalink. A real old recipe for the pennant is split with the good teams and beat up on the bad teams. With a losing record against last place teams, I have my worries. Wacha is principal among my concerns. I think of him as a co ace but not sure anymore.